The project of the photovoltaic solar installation in the Mercat del Carmel in Barcelona is the first initiative of sustainable popular capitalism. Popular participation in the production of energy opens a new path for markets, fundamental focus for social relation and culture in a sustainable city. The popular participation solar installation will save around 25 tones of CO2. Everyone of us is capable to act for the reduction of the emissions that contribute to global warming. Renewable energies are the best possible investment. The Ola Solar del Carmel, 12th may 2007. 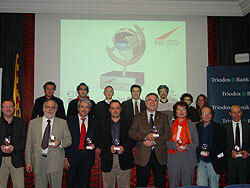 The 28th January 2008 the Project Ola Solar of the Mercat del Carmel received the Premio Eurosolar 2007 (Spanish edition) in the category of "popular initiatives and owners of solar installations". Solar photovoltaic energy allows us to convert the solar rays into clean electricity without the need of fossil fuels or nuclear stations. 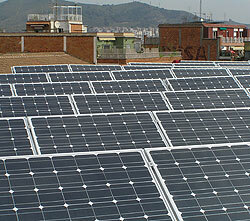 Currently, the solar photovoltaic energy is a mature technology and one that the current legislation promotes. For this reason in the different states of the European Union there is a specific legislation that promotes the investments in solar energy. Spain is not an exception. The production of energy with renewable sources is regulated by the Real Decreto 436/2004 (BOE of the 27th March 2004) which establishes a bonus of 0.44 €/kWh on the base price of the kWh generated, and this bonus is guaranteed for a period of 25 years (stations of solar photovoltaic energy of the subgroup 1.1 of no more than 100kW of installed power: Rate: 575% with respect to the Average Rate of Reference of the Continuous Market during the first 25 years since its launch and 460% from then on). In the case of changes of legislation the Real Decreto established also in article 40 that: "the subsequent rate revisions will only affect to the installations that join after the revision". In the last years there has been an important development on the investment in solar energy due to economical incentive. Some banks and organizations offer this technology in their investment's catalogue. However, they usually focus onto large assets and not small ones. This is a project to help that small investors can enjoy the profitability that may offer the renewable energies. The project OLAR SOLARES (Solar Waves) designed by Terra Foundation wants to make possible that people and entities invest in photovoltaic energy projects in accordance with the incentives foreseen by the current legislation. The idea of the Solar Wave foresees the accessibility to the renewable energy systems amongst citizens with a practical application: taking part in popular projects linked to the neighborhoods. The formula for every Solar Wave is the participation account promoted by a non-profit organization like Terra Foundation. To carry out this project of SOLAR INSTALLATIONS OF POPULAR PARTICIPATION is essential to have the public space where to place it. For this reason in the first SOLAR WAVE, an agreement was signed with the Institut de Mercats de Barcelona (the Institute of Markets of Barcelona), with the aim to place it on the roof of a market: in this case, the most suitable came to be the Mercat del Carmel. The aim of each sponsored SOLAR WAVE will be to share the yield that the law states for this kind of installation of renewable energy and to give it back to the "participants" annually. First the capital is recovered, and then come the benefits, always according to the amount of the initial contribution, and taking away the expenses for maintenance, insurance and project management. Terra Foundation would like to repeat the experience with other equipments, not only in Barcelona but in other towns, if the idea is well received amongst citizens. There are some initiatives in the industry based in building photovoltaic stations without a follow-up system which, even though they have a lower yield, are more economical. The difference is that in the SOLAR WAVE, the citizen can participate and follow the "solar work" like the person who owns stock exchanges. The investment in a project of SOLAR WAVE is an ethical, solidary and sustainable activity. It is organized so it does not depend on the traditional bank system, but in a way that it is a true popular movement towards renewable energy and against climate change: an initiative of popular capitalism. Starting from the current legislative frame of giving incentives to renewable energies, Terra Foundation has designed a project accessible to the popular public. That the citizen with average resources can benefit of this possibility of investment foreseen by the Spanish legislation. In collaboration with the Institut de Mercats de Barcelona it has been planned that the first solar installation will be placed on the roof of a local market. This market is by itself a public place that contributes to the collective benefit (principally with healthy foods). Due to the suitability of the roof and the easy installation, the Mercat del Carmel in Barcelona (c/ Llobregós, 149) was chosen. This project makes of the Mercat del Carmel the first public space that allows the popular participation against climate change investing in renewable energies. It is a unique experience in our country and that the Terra Foundation would like to extend in future initiatives. With this new project, the customer of the market and, in general, the citizenship will also have in the market an environmental benefit cutting emissions of greenhouse gasses. At the same time, this popular installation will have some benefits according with the legal frame that allow to recover the investment done in a period of less than 10 years, with the economical incentive guaranteed to 25 years. 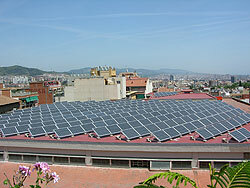 The total investment in the photovoltaic station of the Mercat del Carmel is 301.000 € for 43.7 kWp. The project will have 41.4 KW of power and the predicted annual production is 51.000 kWh/year. 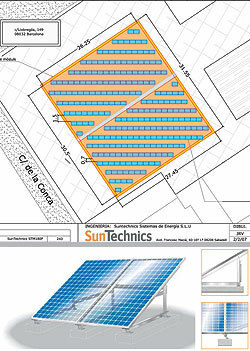 The technology and the installation of the solar station were contracted to the company SunTechnics. The yearly expenditure in maintenance, insurance, project management, etc. is estimated to be around 5.000 €/year. The station will have a monitored system in situ and another one with remote access via internet. It is calculated that the gross output will be around 24.000 € and it will save around 25 tones of CO2. A contribution of 1000 € in the project will mean being the owner of around 175 kWh/year of clean electric energy, that is equivalent to savings of around 80 kg of CO2 per year. We could say that contributing with 1000 € in solar energy allows for an energy saving of 7% of the average electrical consumption per person and year. In short, an investment that promotes the development of renewable energies is the key to fight climate change. With the project of the solar photovoltaic station of popular participation, Terra Foundation wants to help the city of Barcelona to access the advantages that renewable energy offers. This project, moreover, will become a permanent cultural offer against climate change, where the shoppers at the market and the citizen in general are the major figures of a new way to save energy for the future and for the communal wellbeing. The participation of the Institut de Mercats de Barcelona in this project intends to give more service to the users of these public facilities. For people interested in investing towards renewable energies in order to cut emissions and to recover the investment with the benefits foresight by the law at the end of the 25 years, they can take part in 3 different levels. In total, the admissible applications in this project of the photovoltaic station in the Mercat del Carmel will be around 200 participants. The aim is to achieve the maximum number of beneficiaries as possible. With the help of the institutions and the legal incentive it will be possible to recover the investment in 8 to 10 years.